Russia began to know Islam by the mid of the 10th century when Muslim Bulgars and Tatars introduced Islam to Slavic princes. The competition is slated to run between June 14 and July 15, and it features seven Muslim nations out of the 32 contestants; they are: Egypt, Nigeria, Tunisia, Senegal, Morocco, Iran, and Saudi Arabia. Moreover, there are Muslim players in the squads of other non-Muslim countries also in action in the ongoing tournament, like France, Russia, Australia, Serbia, Denmark, Germany, Belgium and Switzerland. These players originally hail from Muslim countries, namely, Mali, Guinea, Algeria, Mauritania, Tatarstan, Turkey, Bosnia, Tanzania, and Albania This means there is an immense gathering of Muslim athletes in this major football festivity. So, let’s shed some light on the relation between Islam and Russia. Russia began to know Islam by the mid of the 10th century when Muslim Bulgars and Tatars from the Muslim states of Volga Bulgaria in far easternmost Europe and the Umayyad Caliphate introduced Islam to Slavic princes. The Slavic rulers rejected the notion of giving up their pagan traditions which contradict with Islam like drinking wine which the Slavic literature describe as the “very joy of their lives”. Remarkably in 988 AD, Slavs including Russians began to adopt Christianity. The 15th century marked the beginning of countless military invasions between Russia and the neighboring Muslim emirates and khanates which ended up by occupying the Muslim populations of a sum of 17 Muslim countries. Fortunately, the 20th century brought at its end the independence of six of these 17 Muslim countries which are: Azerbaijan, Kazakhstan, Kyrgyzstan, Tajikistan, Turkmenistan, and Uzbekistan. The remaining eleven Muslim countries which are still searching for the same fate are: Tatarstan, Bashkortostan, Sibir, Dagestan, Chechnya, Ingushetia, Crimea, and Circassia (Adygea, Karachay Cherkessia and Kabardino Balkaria). The Russian law officially recognizes Christianity, Islam, Buddhism, Judaism and paganism. In fact, the Russian Orthodox Church acts as the de facto if not de jure privileged religion of the state; claiming the right to decide which other religions are eligible for registration. Surveys conducted between 2010 and 2016 estimate Christians between 47.1% and 79.4%. This makes Christianity the largest religion in Russia. The surveys also found that 36 million people, making 25%, declared to “believe in God but without professing any religion”. Furthermore, about 18,600,000 people, representing between 7% to 13%, were atheists, while 7,900,000 or 5.5% didn’t state any religion. These findings make atheism the second largest group after Christianity in Russia. The surveys reported the existence of minority religious group like 4% Muslims (excluding the populations of the above-mentioned eleven Muslim countries). Moreover, there are 1.2% Pagans numbering 1,700,000 individuals, in addition to 700,000 Buddhists constituting 0.5%, 140,000 (0.1%) Hindus, and 140,000 Jews. According to the 2010 Russian census, Moscow officially has less than 300,000 Muslims. Some estimates suggest that they number around one million Muslim residents and up to 1.5 million Muslim migrant workers. Moscow, the capital city, has four mosques, the largest of which is Moscow Cathedral Mosque with a capacity of ten thousand worshippers. It was first built in 1904 and then rebuilt after demolition in 2015. It’s sometimes called “Tatar Mosque” because its congregation consisted mainly of Tatars who constitute the majority of Muslims in Moscow. The Old Mosque of Moscow was built in 1823 to replace an earlier private mosque that had been destroyed by the 1812 fire. It lies at Bolshaya Tatarskaya Street in Zamoskvorechye, a neighborhood formerly settled by Tatars. The land’s owner was a Tatar merchant, Nasarbai Hashalov. The Tsarist authorities permitted the construction of a “Muslim house of prayer” on condition that it wouldn’t be called a mosque and that its facade wouldn’t differ significantly from neighboring houses. 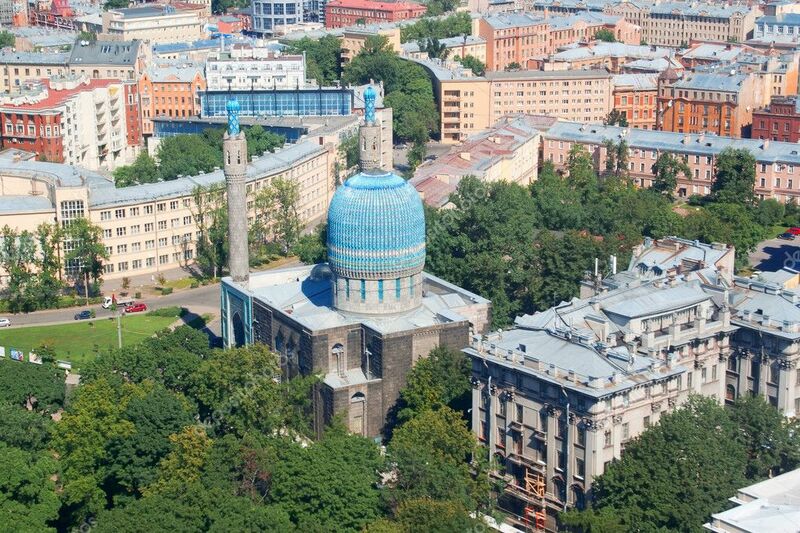 However, the dedicated efforts of Tatars concluded fruitfully by adding the cupola and minaret in 1880. Afterwards in 1915, the Muslims added a madrasa to the mosque’s building. Even though, the Soviets shut down the mosque in 1939 and they demolished its minaret, and purged its last imam. Worship in the mosque didn’t resume until 1993 and the minaret was rebuilt. In 1991, the Muslim community built the Islamic Cultural Center of Russia in Moscow where it contains a madrassa (religious school). Another notable Russian mosque is Saint Petersburg Mosque. It was the largest mosque in Europe outside Istanbul, Turkey at the time of its inauguration in 1913. Nevertheless, the Russian closed the mosque several times. In 1956, at the request of Sukarno, the first Indonesian President, the mosque was returned to the Muslim community. Its minarets are 49 meters tall while the dome is 39 meters high. It can accommodate up to five thousand worshippers. By that time, the Muslim community of the Russian then-capital exceeded 8,000 people. Currently, Saint Petersburg has a total population of five million people, 2.2% of whom are Muslims according to the 2012 survey. The majority of the city’s Muslim community are immigrants from Tatarstan, Uzbekistan, Azerbaijan, and Tajikistan.